Have you ever noticed that RimWorld’s planets all seem sort of the same? Or maybe you think they have too much land and not enough ocean? Or perhaps you’ve been bothered by the odd placement of certain biomes? Well, your worries are over! The Realistic Planets Mod allows you to create a wider variety of planets, and also “cleans up” the game’s biome placement so that the planets you play on look more… realistic. The “Create World” page has been altered. First, you can now select “coverage” anywhere from 5% to 100%, in 5% increments, instead of having to choose between just 30%, 50% and 100%. Second, there’s a new “sea level” slider, which determines the amount of ocean coverage your world will have. You can create anything from watery worlds with only a few small continents to barren rocks with no surface water at all. The “rainfall” slider is now a relative rather than an absolute setting, as a planet’s overall rainfall is influenced by its sea level. A “high” rainfall level on an arid planet, after all, will for obvious reasons be rather less than even a “low” rainfall level on a planet with extensive oceans. Additionally, the “temperature” settings have been “stretched,” so that cold planets are colder than in vanilla, and hot planets are hotter, by up to about 15 degrees C at the ends of the scale. The mod also adds a set of “world type” options from which you can select. These are simply shortcuts to sets of slider settings intended to allow you to quickly and easily create planets predominantly characterized by particular biomes. The Realistic Planets Mod fixes a few oddities in biome placement, mostly involving arid shrublands and deserts. Arid shrublands are described as semi-arid regions that surround deserts, yet in vanilla, they’re placed in areas that are warm enough, but not rainy enough, to be rainforests. And deserts… well, in the vanilla game, any tile that’s not rainy enough to be forest and not cold enough to be tundra, becomes desert. The mod limits deserts to areas where the combination of temperature and rainfall makes deserts likely to actually exist, and moves arid shrublands to regions of the globe surrounding those newly-limited deserts. Grasslands, as the name suggests, are areas where the vegetation is dominated by grasses and shrubs. The soil is fertile, but there is little protection from the elements. Steppes are high-altitude grassland regions. A steppe may be semi-desert or covered with grass or shrubs or both, depending on the season and latitude. Savannas are mixed woodland/grassland ecosystems typically found between rainforests and deserts. Though savannas are more forested than grasslands, their trees are still spaced widely enough that sufficient light reaches the ground to support an unbroken layer of grasses. Despite the abundance of plants, the soil is mostly dry, and a wide variety of animals roam the area searching for food and water. Temperate deserts are cooler but often even drier than subtropical deserts. Vegetation is sparse, and the ground is typically more rocky than sandy. Oases are vibrant, isolated bits of life and color. In even the harshest of deserts, after all, groundwater occasionally manages to make it to the surface, and where it does, life blooms. Plants grow around small ponds, and animals gather in search of water and shade. If you’re interested in the nitpicky details of how biomes are placed, the “Biome Grids” files in the mod’s “About” folder provide graphs showing biome placement by overall temperature and rainfall for both the vanilla game and the modded game. The Realistic Planets Mod also allows you to have the placement of faction settlements take racial temperature preferences into consideration and/or to have each faction’s settlements “grouped” to simulate actual nations. These options will be automatically disabled if you’re also using “Faction Control,” in order to avoid conflicts. The author has tried to make sure that this mod works with other mods that also alter planet generation. It’s specifically confirmed that the Realistic Planets Mod is compatible with “More Random Seeds,” “My Little Planet” and “Prepare Landing,” though you’ll want to turn off the latter’s “precise world generation percentage” option to avoid meaningless but annoying error messages. 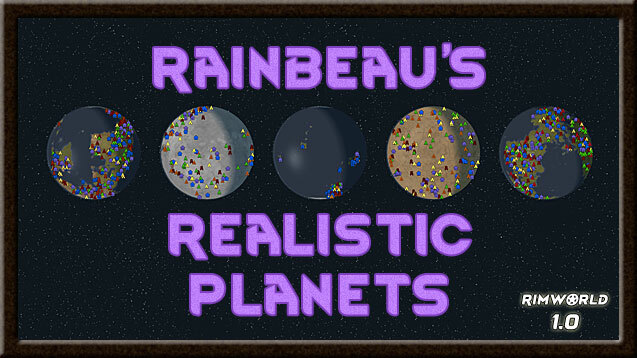 The Realistic Planets Mod should also be compatible with other mods that add new biomes. If you happen to notice that a biome added by another mod seems a bit “out of place” as a side effect of the changes this mod makes to vanilla biome placements, let me know, and I’ll be happy to see about adding a patch to deal with the problem. On a related note, if you’re using “Terra Core” or “Advanced Biomes,” both of which add a savanna biome, or “Nature’s Pretty Sweet,” which adds both a grassland and a savanna biome, you’ll find that the biomes from those mods replace the similar ones from this mod. This is deliberate, as those mods’ versions of the biomes add features that this mod doesn’t make available. Finally, plants and animals added by other mods will have a chance to show up in this mod’s new biomes. However, since this mod only specifies that if modded animals or plants are defined to show up in vanilla biome “X,” they should also have a chance to show up in new biome “Y,” there may be oddities. Some extra added customization is always welcome! The Realistic Planets Mod brings more depth into the creation of the planet before you settle your colony, and it comes with a lot of new biomes which are always a great motivator to start a new colony and explore the world!